Around 150 million of tons of tomatoes are produced annually. Greatest producer of tomato in the world is China. Tomato is rich in acids that can remove smell released by skunk. These acids can also be a part of various lotions and hygienic products that are used for cleansing of the body and various objects in the house. Leaves of tomato are usually 4 to 10 inches long and divided in 5 to 9 leaflets. Tomato contains lycopene (chemical that belongs to the group of carotenoids) that can prevent development of certain types of cancer. 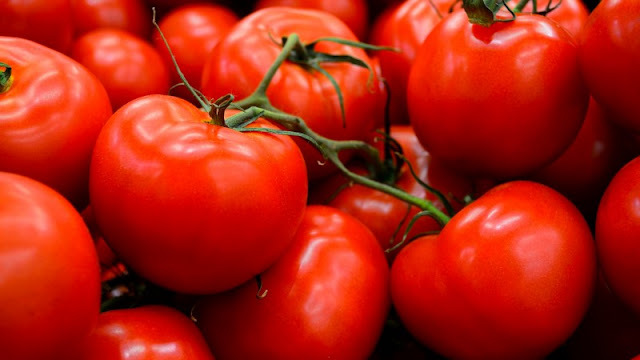 Other than that, tomato has beneficial effect on the heart, blood pressure, cholesterol level and eye sight. Tomato grows like a vine. Stem is covered with fine hair which facilitates bonding to the ground or substrate. Tomato is harvested unripe to prevent rotting and to ensure longer shelf-life. During the early '90, scientists created genetically modified tomato that can remain fresh extended period of time. Most popular tomato species are red. Cultivated tomatoes can also be yellow, orange, pink, green, black or white in color. Tomatoes in the wild are pollinated by insects such as halictid bee. Cultured varieties of tomatoes can be self-pollinated. Some of them are pollinated by the help of artificial wind and by cultured bumblebees. Heaviest ever recorded tomato had 7 pounds and 12 ounces in weight. Longest ever recorded tomato had 65 feet in length. Size of tomato depends on the species. Smallest tomatoes have 0.4 to 0.8 inches, large tomatoes have 4 inches, while majority of cultivated tomatoes have 2 to 2.4 inches in diameter. Wild tomato is perennial plant (it lives more than two year). Cultivated tomato is annual plant (it lives one year). Stem, leaves and green (unripe) fruit contain alkaloid called tomatine which can induce poisoning. Although most people believe that tomato belongs to the group of vegetables, this plant actually belongs to the group of fruits. Fruit of tomato is called berry. Ripe tomato is safe and highly recommended piece of fruit because it contains high level of mineral and vitamins. Tomato can be consumed raw, in the form of soups, juices or as ketchup.